Archaeologists from the Anthropology and Archaeology department at the University of Bristol has revealed that a mass grave discovered in the 1980s dates from Viking era thanks to Radiocarbon dating. Radiocarbon dating (also referred to as carbon dating or carbon-14 dating) is a method for determining the age of an object containing organic material by using the properties of radiocarbon (14C), a radioactive isotope of carbon. The study has shown that the burial site dates from the late 9th century, roughly the same time when the “Great Heathen Army” wintered in Repton, Debyshire and campaigned across Mercia. The burial site was excavated at St Wystan’s Church in Repton in the 1970s and 1980s by archaeologists Martin Biddle and Birthe Kjølbye-Biddle. 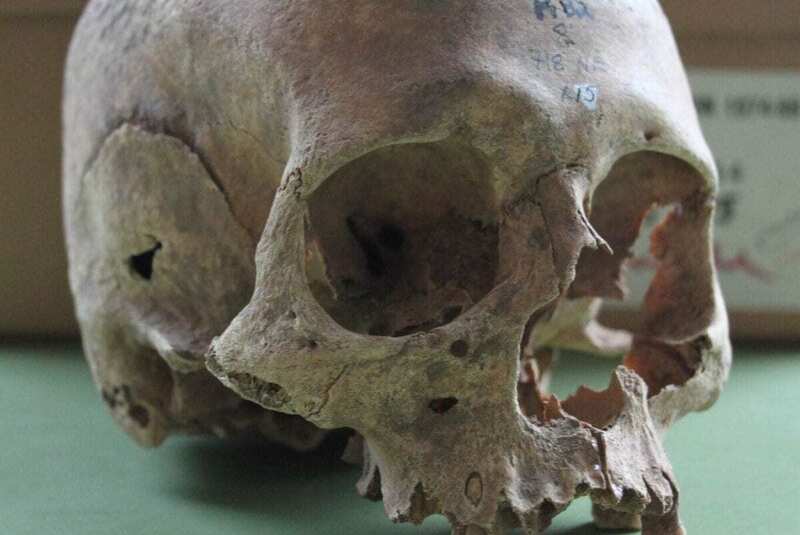 They uncovered several Viking graves and the mass burial site of around 300 bodies beneath a shallow charnel mound within a ruined Anglo-Saxon building. Previous attempts at dating the mass burial created conflicting results with a mix of dates and ages. Project leader Cat Jarman said: “The previous radiocarbon dates from this site were all affected by something called marine reservoir effects, which is what made them seem too old. When we eat fish or other marine foods, we incorporate carbon into our bones that is much older than in terrestrial foods. Adjacent to the charnel mound, another grave site containing four juveniles placed in a single grave also suggests a connection to the Vikings. Carbon dating places the burial around 872-885 CE and is believed by Archaeologists to be a ritual grave for sacrificial killings to accompany Viking dead. Cat Jarman added: “The date of the Repton charnel bones is important because we know very little about the first Viking raiders that went on to become part of considerable Scandinavian settlement of England.